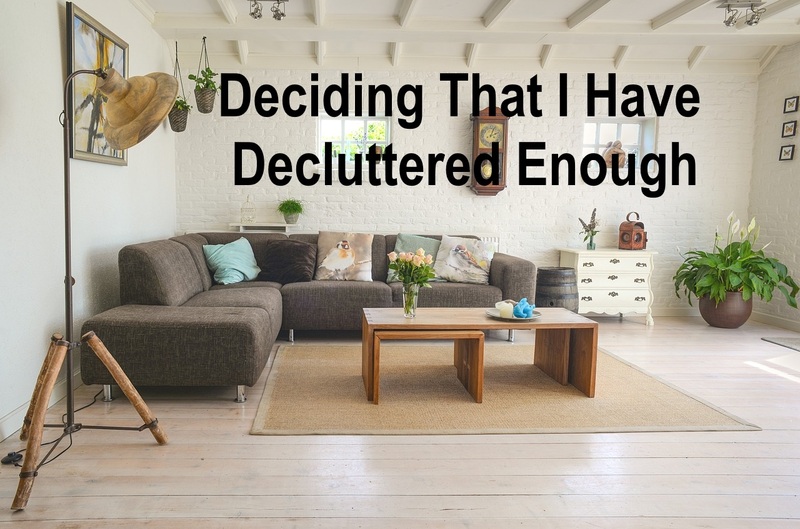 There have been plenty of times I have wondered if I would ever be done with decluttering. It seemed I would deal with one section of the house or shed and then find another area that needed to be done. People would give me things they no longer wanted. Sometimes I would buy stuff and later decide it was a mistake purchase. Recently I realised I had decluttered enough. A bag appeared in my letter box for donations to a charity I like to support. You probably know the sort, a large coloured plastic bag you fill with unwanted clothing, books, unbreakable household wares and the like. I looked around and realised I didn't have things sitting around that I wanted to get rid of. I had pared my wardrobe down to items I wore frequently, or at least would when the weather was right. There were no books or magazines I was willing to part with. The small number of DVDs I had would be watched again. There was no surplus linen. Am I sure it's mission accomplished? I did manage to find a couple of cushions to donate and a fabric footstool filled with polystyrene beads. They took up quite a bit of space in the bag. There would be a few more items I could part with but at this time I don't choose to. A friend had a garage sale on the Garage Sale Trail Weekend last year and I added to her sale and helped out. This year she is having a sale again in preparation for moving house in the future. I will help out with the event but have nothing of my own to put out for sale. How will I ensure I don't accumulate clutter in the future? I need to think carefully before buying things. I expect I will make a purchase now and then which I later decide was unnecessary but that's okay. From time to time I will probably buy a piece of clothing which doesn't end up getting as much use as I thought it would. I am not going to stress about that. The important thing is that the majority of my purchases get plenty of use or are things I truly love to look at. It's fun to buy a decorative item for the house or garden and I don't want to stop that altogether. I will probably follow the 'one in one out' rule and part with one item if I buy something new. This way I can ring the changes without clutter building up. Decluttering can take a long time. However, I am now at the point where I feel I have decluttered enough and from here on it will just be a matter of maintaining that situation. Oh, it would be lovely to get to that blissfully simple position! Well done, you must feel proud of yourself for this!